Grow a garden filled with an array of colorful perennial wildflowers with our specialty Perennial Wildflower Mixture. 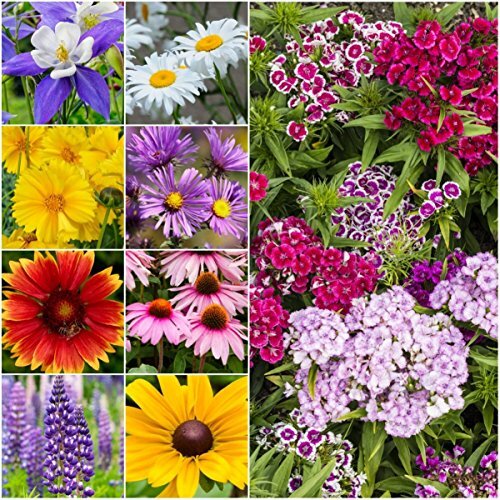 This specialty blend contains 16 of our most popular selling perennial flowers. Favorites such as Columbine, Shasta Daisy, Black-Eyed Susan & Purple Coneflower are included. The Perennial Wildflower Mixture will produce flowers in practically every color of the rainbow, from red, orange, yellow, blue and more. When fully grown, the plants range in height from 8 inches, up to 48 inches tall. The average growth for most of the plants is around 20 inches to 30 inches tall. Perennial wildflowers will establish a deep root system in it's initial year of growth. The plants will then wilt on the surface with the first killing frost, regrowing the following Spring season to display hundreds upon hundreds of gorgeous & colorful flowers, all summer long. Many wildflowers will also readily self seed, creating new plants the following year as well. Because of the colorful nature of this mixture, hummingbirds, bumblebees, honeybees and butterflies will all be attracted to the garden.